Over the past few months, women – in a quiet collective scream – have been telling a story at a frequency that is fracturing what was a seemingly impermeable power structure. Those among us who initially dismissed the #metoo movement are waking up each morning to a newly unemployed perpetrator in the headlines, and to the idea that our culture may be capable of something better. Hollywood can take some credit for the momentum, and is attempting leadership as disturbed panic across the sectors begins to give way to introspection – an introspection examining systemic sexual harassment through a lens of power, and who holds it. Those who have been studying inequity in Hollywood for years are ready with the simplest of solutions: put more women in power positions, i.e. hire more women directors. Statistically, women directors put more women characters on screen, hire more racial and ethnic minorities, and hire more women in pipeline crew positions. Moreover, women filmmakers diversify the perspective from which our collective story is told, to more accurately represent our society’s experience and values. Film literally reflects who we are, and, in turn, we learn to value the stories and perspectives that we see. Film Fatales is a network of female-identifying feature film directors, who meet regularly to share resources and support each other in the creation of their films. There are dozens of chapters around the world. The Salt Lake chapter became official last month, and joined sponsors Utah Film Commission, Luna, Women Make Movies and The Harnisch Foundation in welcoming Fatales from around the country and world to the Sundance Film Festival last night, at the Utah Film Commission on Main. 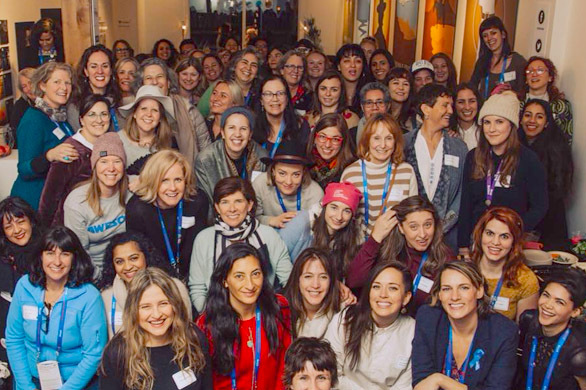 Over 100 female-identifying directors, including a dozen with premieres at the festival, met and mingled with each other, and with distributors, financiers, and others from the industry. Old friends reconnected, colleagues who had only worked remotely got to meet in person, and new connections were forged. Many cited the network as invaluable to their work. Film Fatales was created in response to a startling lack of female directors in the film industry. The famous Bechdel-Wallace Test provoked conversations about diversity in film in the 1980s with a simple three-part yardstick: are there (1) at least two female speaking roles that (2) speak to each other about (3) something other than men? It seems reasonably achievable, yet a third of the top 50 movies of 2016 failed. More recent studies revamp Bechdel using intersectional criteria, tracking female and non-white department heads and crew, the presence and prevalence of non-white female-identifying characters, and the extent to which characters are sexualized, for example. Predictably, many of the films that fail the original Bechdel Test also fall short regarding the updated, more intersectional criteria. There is still, 30 years on, one predominant voice – one gender, race, ethnicity, religion, and demographic – telling the majority of the stories, perpetuating the cultural values of only that voice. The Film Fatales are among those deepening the film landscape. In sorority, with collaboration, resource sharing, and cheerleading, they are helping each other to compose a wealth of content from alternative perspectives, and with it, an alternative lens through which to watch and critique films. They are diversifying the stories that inevitably are absorbed as cultural values, such that other voices don’t have to scream to be heard. Contributing writer, Diana Whitten, writes, makes art, and directs film.